Caution: Belligerent, chaotic metalcore ahead. Every copy of Every Time I Die's new album From Parts Unknown should come stickered with that warning right on the front. After releasing Ex-Lives back in 2012 to rave reviews, the Buffalo five-piece is back with a bloodthirsty vengeance. Is it Every Time I Die's best record? Probably. Is it heavy? Oh, definitely. Do you need to hear it? Absolutely, right now. 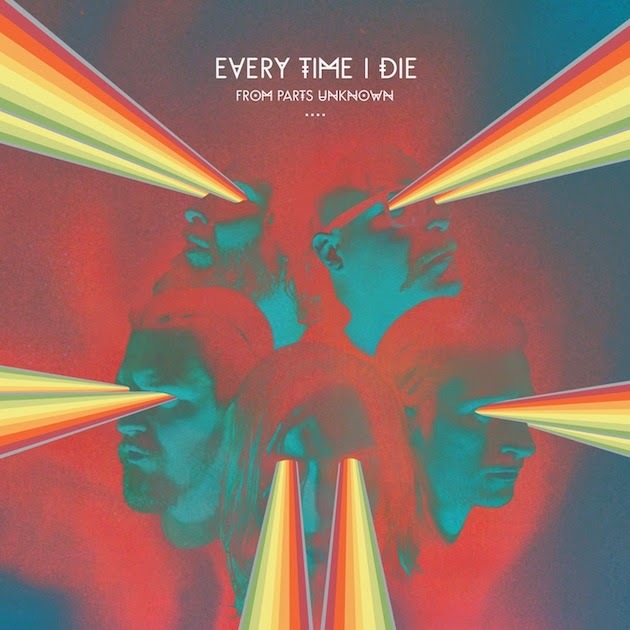 Every Time I Die have been around for practically forever. Roughly 15 years in the making and seven albums deep, you would imagine the band's sound would soften or slow down into a commercial soup of drivel rock, but that's not the case here. Kurt Ballou of Converge was enlisted as the producer and the band went to work creating an album that rivals their gritty back catalog in every way. The result is a 30 minute onslaught of screeching chords, deep chugs, winding chord progressions and a sweeping sense of civil unrest. It's chunkier, faster, and meaner than Ex-Lives, so as Samuel L. Jackson once famously said, "Hold on to your butts." Things get downright spooky with "Moor," the most different and weird song on the album. The haunting, chinking piano intro looms as Buckley's vocals wail like a lost soul. When the song kicks in, it will envelop your room in a mass of sludge so thick you'll be stuck for days. One listen is all it takes to appreciate the fantastic musicianship that holds From Parts Unknown together. Guitarists Andy Williams and Jordan Buckley tap, slide and riff out a collage of parts into beautiful, tempo-shifting songs. Stephen Micciche puts the bass to good work, and Ballou's mixing makes sure every thump and bump is out there and audible. Most notable is drummer Ryan Leger's blitz on the kit. To put it bluntly, he's fast – the snares pop off like automatic gunfire, and the toms roll like thunderclaps. Double bass pedals almost heckle the guitars, sneering at them to keep up in the high BMPs. Despite their age, these guys still rock like like they're in their early 20's. The music, however, reads like a mature piece of assembled chaos. Buckley's lyrics are still top-notch and some of the best in the genre. Direct and poetic with an urgent abrassiveness, he delivers line after line of memorable headpunchers like a new-age Shakespeare. "Idiot" cascades into a fiery ending as he cries, "All I want is for everyone to go to hell/it was the last place I was seen before I lost myself" before concluding "All I want is for everyone to come to hell/there we can be free and learn to love ourselves." It's a hypnotic delivery that should have fans clamoring for mic grabs at future shows. In terms of substance, the album is a bitter acid eating into fine machinery. It's like scratching into sheet metal with a screwdriver - expect no catharsis in this half-hour blast of maniacal metalcore. Crank the stereo, crack a beer and mosh around your room. No one's going to judge you, especially with such a masterpiece destroying your ear drums. From Parts Unknown is a blast, so listen loud and proud because a decibel is only a unit of measurement. Be sure to catch Every Time I Die all summer long on the Vans Warped Tour.